Beautiful Kane'ohe waterfront studio overlooks a panoramic mountain range, ocean view and and old Hawaiian fish pond (over 3000 fish). Relax in the Jacuzzi or by the pool and take in the breathtaking scenery. Kaneohe is located in Honolulu County on the eastern coast of the island of Oahu between Heeia and Kailua along Highway 830 near Kaneohe Bay and Mokuoloe Island. There is a King size bed in Living room. There are three rentals on the property. Pool is shared by all three rentals. Property reserves as a whole Estate only during the holiday season. $225 per night. 30% down to hold a reservation. Balance due 60 days before check-in. $200.00 security deposit. $100.00 cleaning fee. 4% processing fee. Listed rates do not include tax. Holiday and peak season rates and required length of stay may be different than quoted above. Credit cards, cash, checks and wire transfers accepted. Minimum night stay varies amongst the various rental units. Many rentals have 30-night minimums. Tax number: TA-048-778-0352-01. The apartment was very nice. We loved the pool and the fish pond. It was very clean, although we did have the company of a giant cockroach one evening. Thank Goodness my man was with me... Lol. Property manager was AMAZING! We will be back! My wife and I wanted a private and low key vacation which we got by staying at the "Honu Hale Studio" Secluded in a residential area it afforded us privacy and luxury. I would recommend it for those who wish to "get away" from the hubbub of tourist traps. Well kept and clean. The kitchen and shower were fantastic. The view was superb overlooking the bay, the fish pond and the Eastern sunrise. Our hosts, live on the property but we never saw them. They were terrific with local lore and places to visit when we needed it but otherwise left us alone to explore and relax. A big bonus for us was feeding the fish in the fishpond. Nice! our visit to your property was outstanding. hope to come back again in the near future. We were in awe the moment we stepped on to the property. The view is absolutely stunning! You have the pool and jucuzzi right outside your door. The studio is beautiful ;perfect for 2 people. The bathroom is amazing and the shower is awesome. You have everything you need for an amazing stay. The property is clean and nicely decorated. The king size bed is quite comfy. The only thing I would add would be a few baking pans, baking sheets and hot pads to the kitchen. Other than that this property is "PERFECT"! I would definitely stay here again and recommend this to friends and family. We had an amazing time. Jennifer was a great host and we really enjoyed the property, especially walking around the pond and feeding the fish. Each morning I took pictures of the sunrise, it was unbelievably picturesque . I would definitely recommend staying here. This was a lovely setting with lovely hosts. Watch them feed the fish in the ancient fish pond each evening. The separate studio was very large and roomy with a complete kitchen, tv seating area and king bed. Definitely use google to find the location. The directions from Vacation Rental Marketplace were totally incorrect and inaccurate. There are two highway 83s for instance. Take the second one off Route 63 that is also marked Kamehameha Highway. There is no highway 830 as VRM indicated. Would definitely return. We had a lovely time at Honu Hale Studio. The view is breathtaking and the fish ponds are amazing. The unit is small but has all the ammenities you need for a short stay. The shower has fantastic water pressure. Jennifer was a wonderful hostess for our visit. We were fortunate to have the place to ourselves, so the privacy was perfect! The location is unique and the unit was tastefully finished and furnished. We toured the other available units on site and they offer ample space and convenience for larger groups who wish to book the property for things like a family reunion, wedding or other engaged event. The 3 acre fish pond was remarkable and very pleasant to stroll around. We fed the fish and that in itself was an adventure! There are a number of great beaches within a few miles and also for hikers, there are both simple and challenging hikes with beautiful terrain and vistas. Our thanks to Jennifer and her family for making our stay such a memorable one. A peaceful retreat after traveling around the island all day. 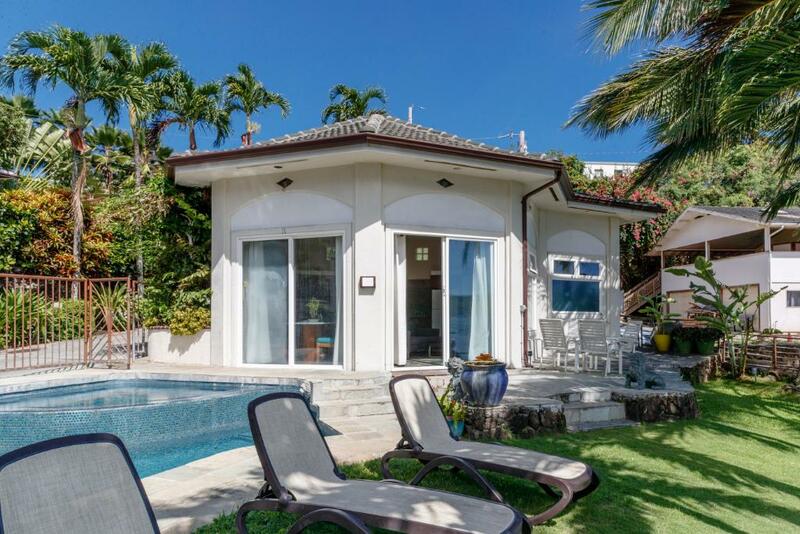 The Honu Hale studio is a great place to stay while visiting the beautiful island of Oahu. It was so quiet and peaceful, away from the bustle of Waikiki but only a 25 minute drive if you wish to visit there. Kaneohe is a beautiful place and is close to Kailua beach which was one of our favorites. The owners were very friendly and accommodating. We had an amazing trip! Honu Hale is like a hidden gem. The surrounding neighborhood is typical of Oahu; narrow streets, old homes with carports, and lots of vehicles and trash cans. Once you are on the Honu Hale property, it's like being in an entirely new setting at the water's edge. The owners take pride in their place and after you experience it, you won't want to any place else on the island. Waking up to beautiful sunrises behind Kaneohe Bay, enjoying the tranquility of sitting in the gazebo at the end of the dock jutting into the giant Hawaiian pond, feeding the huge fish in the Hawiian pond or the freshwater pond above, and soaking in a jacuzzi under a star-lit were my favorite experiences there. The friends and family who visited us were raving about the place and asked how I discovered it.